Republican vice presidential candidate Sarah Palin appeared on NBC’s ‘Saturday Night Live,” along with Palin lookalike Tina Fey. The show’s opening sketch featured a mock press conference with Fey reprising her role as the Alaska governor. 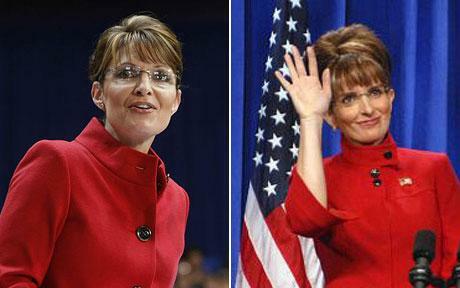 The piece then cut to a shot of Sarah Palin watching Fey’s performance on a television monitor with Lorne Michaels, the show’s executive producer. Addressing several hundred supporters at a fundraiser, the Alaska governor said voters know McCain as a political maverick and war hero and that Obama is trying too hard to link the Arizona senator to the unpopular GOP president. When Palin needed to sell her house during her last year as Wasilla mayor, she got the city to sign off on a special zoning exception — and did so without keeping a promise to remove a potential fire hazard. She also stepped in to help friends or neighbors with City Hall dealings. She asked the City Council to add a friend to the list of speakers at a 2002 meeting — and then the friend got up and asked them to give his radio station advertising business. She sometimes followed a cautious path in the face of real or potential conflicts — for example, stepping away from the table in 1997 when the council considered a grant for the Iron Dog snow machine race in which her husband competes. Two months before Palin‘s tenure as mayor ended in 2002, she asked city planning officials to forgive zoning violations so she could sell her house. Palin had a buyer, but he wouldn’t close the deal unless she persuaded the city to waive the violations with a code variance. Sarah Palin touted her small-town roots and swiped at Democrat Barack Obama during a highly anticipated speech to the Republican convention on Wednesday, ridiculing her critics as “the Washington elite” who did not understand everyday life in America. In her public debut in the spotlight, John McCain’s choice for vice president portrayed herself as a Washington outsider and came out swinging against Obama and members of the news media who have raised questions about her qualifications. “I’ve learned quickly these past few days that if you’re not a member in good standing of the Washington elite, then some in the media consider a candidate unqualified for that reason alone,” the Alaska governor said in remarks prepared for delivery at the convention. 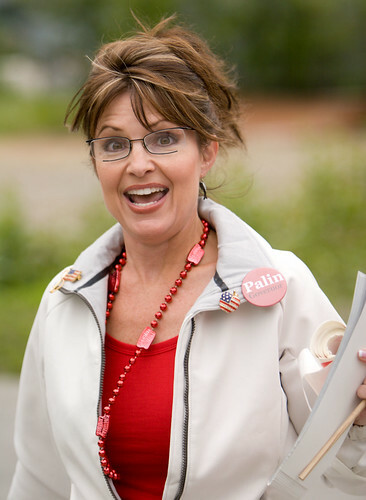 Since McCain made the virtually unknown Palin his choice for running mate, she has been the center of a media storm fueled by disclosures about her unmarried teenage daughter’s pregnancy, a probe into her role in an Alaskan official’s firing and questions about her political record.